Caregivers will get SMS alert as well as an Email if they have missed the Clock in. Admin will go in “Main” Office Settings and will click on “Send No Show Alert to Caregiver”. This results in sending an email to the caregiver. Agency Users will be able to see the log of Missing Clock-in emails sent to the respective caregiver. This log will be shown in ‘Email Log section’ in Caregiver’s profile along with the log of all other e-mails sent to a particular Caregiver. Note: – Steps to get to the log are: Caregiver>Caregiver Profile>Task &Communications. If Caregiver has created an unavailability time, s/he can see this in his/her calendar with the [U] icon, and that unavailability time would be indicated in brown. The system will now send Email and SMS Alert to a Caregiver 30 days before the expiration date of any compliance item (license or certification). Admin/ Agency Users having access to Office settings can Switch ON the service by clicking on “Send Email/SMS Notification to the caregiver(s) when their compliance expiration date is nearing”. Note:- To make sure the SMS goes out, it is important to configure SMS Services Under Admin Settings > Configuration Management > Configure SMS Services. Now, Caregivers are not allowed to clock in and clock out when they are out of threshold times. If Agency User have Switched ON ‘Do not allow Caregiver(s) to Clock-In/Clock-Out outside of threshold times’ in Office settings. Agency User with rights to access ‘client section’ will be able to enter ‘n’ days or months in ‘Re-assessment After’ field. iii. 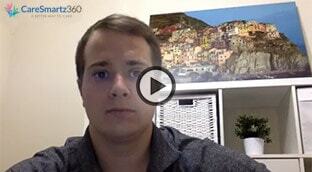 Power of Attorney for property(non-continuing). The client will now be configured as the Self- Pay ‘Remainder’ payer by default. 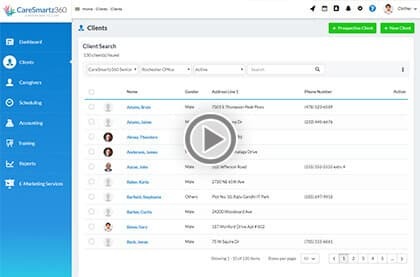 In the emergency contact section of Client’s profile, Agency User can see Client’s emergency person’s contact number as one of the grid columns. Note: – At the time of Adding Emergency Person’s contact number, it should be set as primary to show up under the head of Phone number in the Grid Column. Otherwise, rest of the details will be shown under respective heads except Phone number. When an assessment is updated and completed to become a new care plan, the previously created schedules will reflect the updated information. 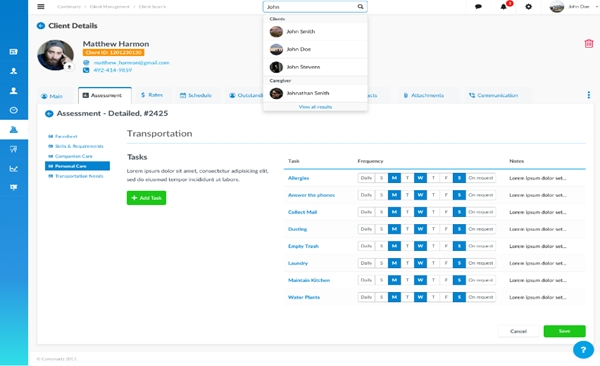 A search bar will be given on the top of the Home Screen of Admin/ Agency User portal. Agency User can type the name of the person he wants to search. Clicking on the name will route the Agency User to the person’s profile section. A “Quick Schedule” link will be provided in the scheduling module on the left menu to facilitate adding schedules without having to go into the individual client or caregiver profiles. Setting minimum radius in office settings is now optional. The agency will determine whether minimum radius parameters will be required to allow clock-in/out. No minimum radius set means caregivers can clock in and clock out at any place as long as they are within the time grace settings. Currency symbols will reflect the country in which CareSmartz360 is being used. a. Scheduling>View>Select Unidentified calls: User will see the actual time without rounding. For Example: If a Caregiver was supposed to clock in between 9:45 am- 10:15 am(Considering 15 Mins is the threshold time). He/ She Clocked in at 10:16 am. The call will be termed as unidentified. Previously, 10:15 am was the time which was shown in ‘Unidentified section’ due to the ‘Round’ setting in Office settings. Now, the actual Clock in time of Caregiver i.e. 10:16 am will be shown in ‘Unidentified section’ section. Previously, Agency users saw Overlapped schedules in Calendar if the schedules are overnight. Now No overlapped schedules will be shown; one single schedule will be shown on the Starting date. For Example: – If there is a schedule which will start at 5 pm on 23rd Oct’18 and will end at 3 am on 24th Oct’18, then the schedule will be shown on 23rd Oct’18 in the calendar. 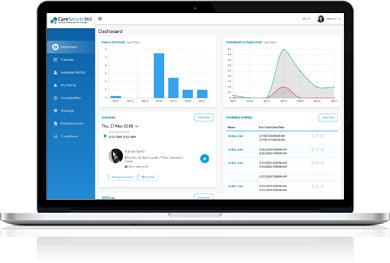 The Admin will use the office settings to indicate whether Overtime is applicable to Client Invoices or not. 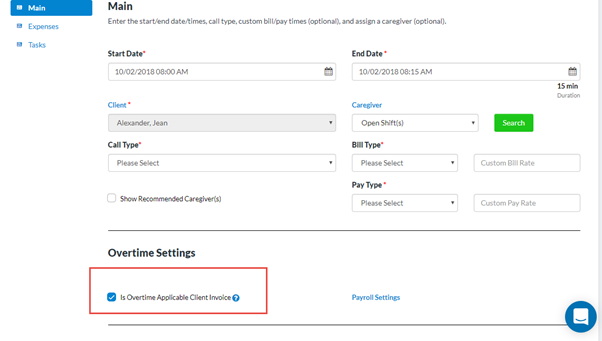 The “Overtime Applicable Client Invoice” checkbox in the schedule window will reflect the default from the office settings. 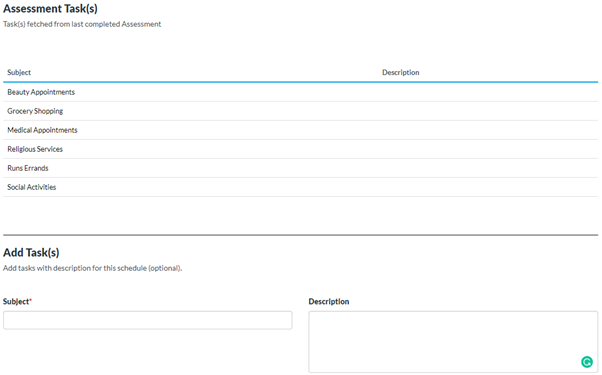 At the time of creating a schedule, all tasks created on that date in Assessment will be auto displayed. Agency user can select the date and then respective tasks created for that date will be automatically shown. For Example: – If in Assessment the five tasks have been set particularly for Sunday. Then if an Agency User will try making schedule say of 28th Oct’18 i.e. Sunday then the system will show those tasks while creating schedules as well.